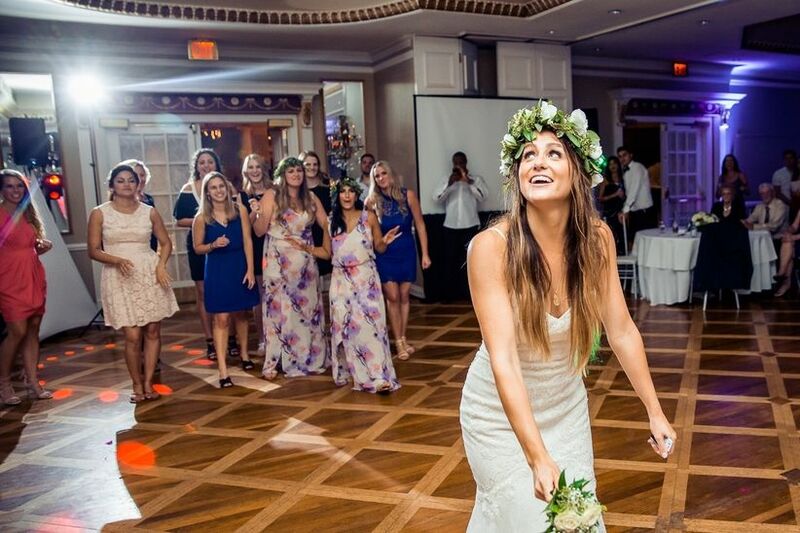 Everything You Need to Know About Wedding Reception Flowers | Wedding Ideas ARE YOU A VENDOR? What is a party without decorations? 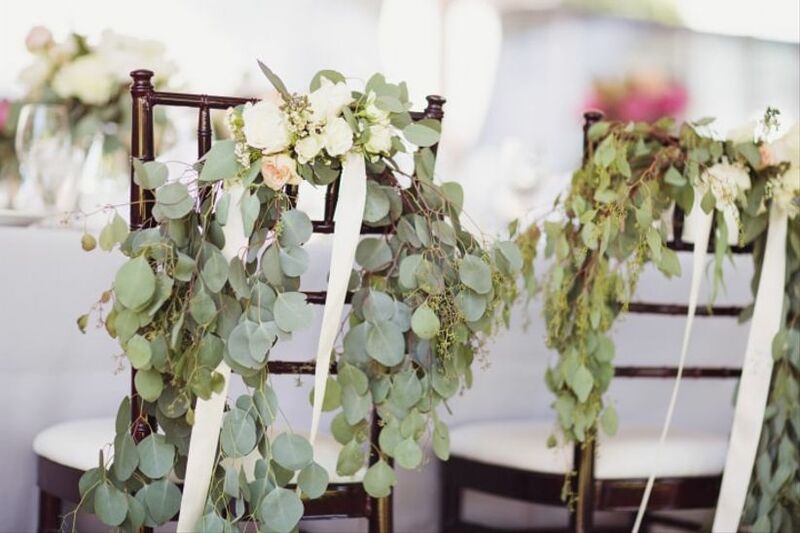 Amp up your wedding reception venue with flowers and greenery to give it that extra something. 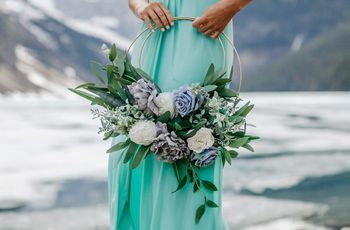 Remember, flowers will eat up approximately 8% of your overall wedding budget, so divvy up the costs between these and your ceremony flowers appropriately. 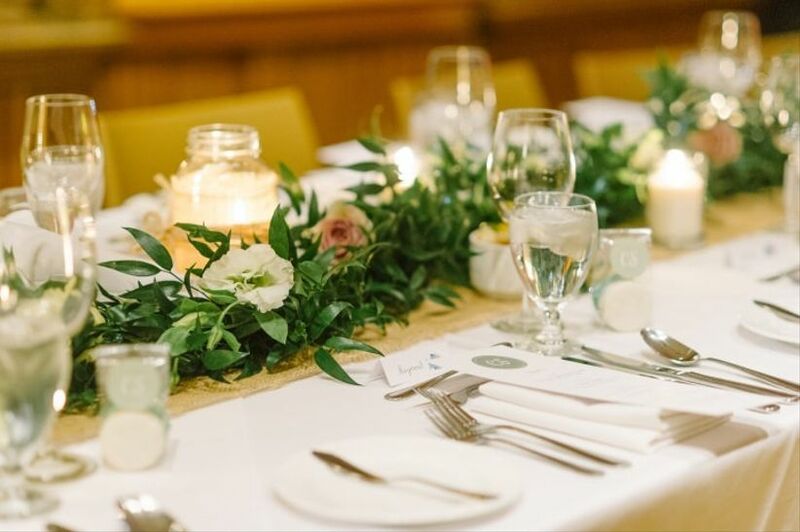 Here is everything you need to know about wedding reception flowers. 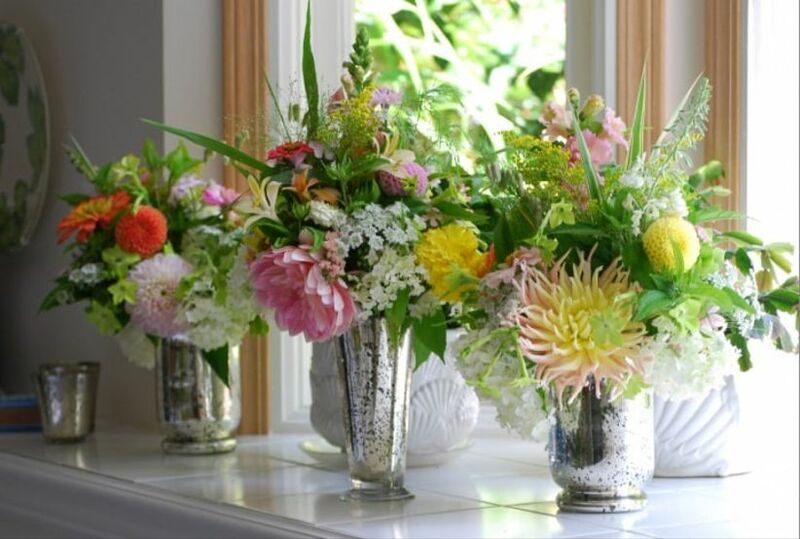 Greet your guests with a few stellar arrangements that match the theme of your wedding. 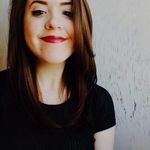 Hosting a barn reception? Put your flora and fauna in crates and barrels to give them some rustic charm. Going with something more elegant? Find some classy compote vases to frame your doorway. 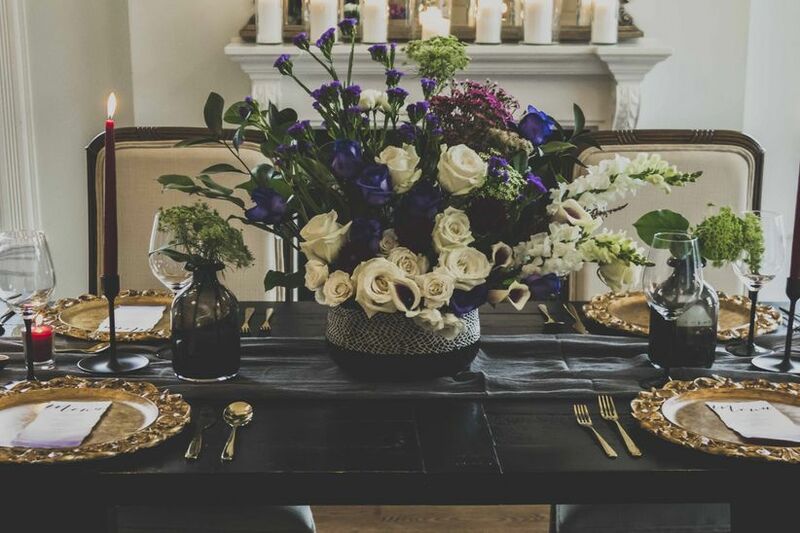 The first thing your guests spot when they enter your venue will probably be the welcome table. This is the space that holds your guestbook and is where they can drop off any cards or presents. While it isn’t the most important part of your reception, you won’t want it to look out of place. Dress it up with a small arrangement or two to keep things looking cohesive. When it comes to flowers, your centerpieces will get the bulk of your budget and your guests attention. You’ll want them to suit the feel of your wedding, so remember to consider your theme, colours and style when crafting centerpieces. If you think they need to be dressed up a little, adding some pearls, gems, feathers and ribbons goes a long way. Need more tips on centerpieces? Check here. Some couples choose to have their own table at their reception, this is called the sweetheart table. While you can always match the centerpiece on the sweetheart table to the others around your venue, you may want to make it a little more extravagant. Remember, if you do bolster yours a little bit, don’t make it too high. You don’t want to block your view of the guests (and vice versa). Greenery can be used for much more than just filler for your centerpieces. It looks great on its own as well! If you want to give your reception an earthy or boho vibe, adding fauna will do the trick. If you don’t want fully green centerpieces, consider using it as an accent on chairs, signs and in garlands. Silver dollar eucalyptus is a current fan favourite and is pretty inexpensive. When you think of a table runner you probably conjure up an image of a long piece of fabric that runs the length of a table. You are not alone. But guess what? You can make them more interesting by ditching the textiles and making them out of flowers. This is perfect if you want to skip adding centerpieces (bonus: your guests won’t have to crane their necks to look past your arrangements). 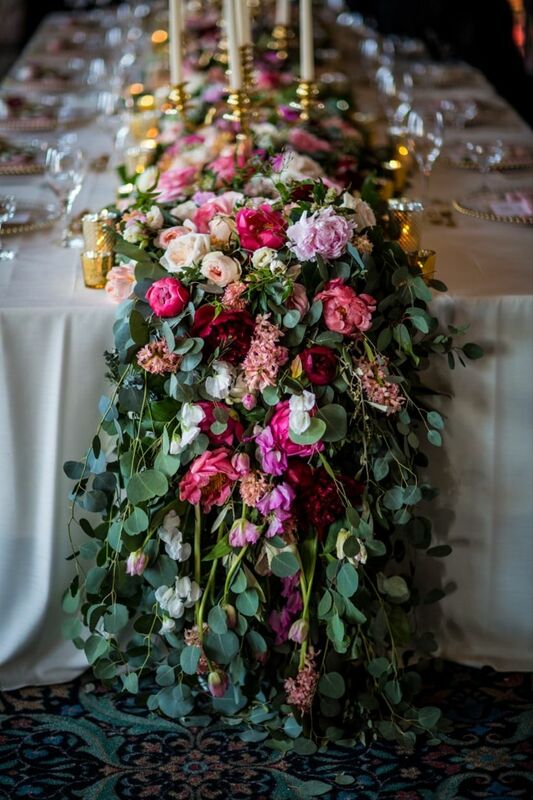 Or, if you want something super dramatic you can add a centerpiece on top of your floral runner. If votives and vases just don’t do it for you, add a few hanging arrangements to take your reception venue to the next level. 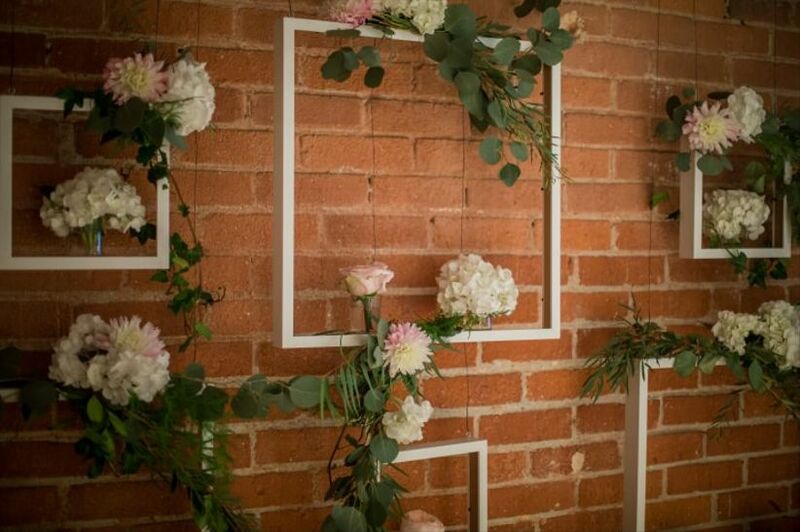 They come in a variety of shapes and sizes, meaning you can easily find a hanging arrangement that suits your wedding style. There is everything from floral chandeliers to blossoms fashioned into orbs, so the world is your oyster. Dressing them up with accessories like ribbons, gems and pearls will make them even more whimsical. Want to add a little something extra to your seating? Consider attaching some flora and fauna to the backs of your chairs. 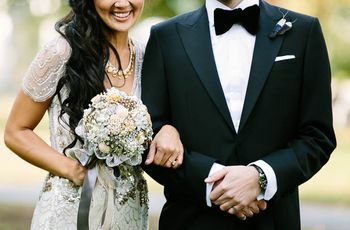 Adding arrangements to every seat would rack up a pretty hefty bill, so reserve them for the guests of honour (that means just the newlyweds or the newlyweds and the wedding party). To play up the seats even more consider incorporating signs with your monogram and a few decorative bits and bobs. If you opted for a classic cake design, jazzing it up with some flowers is always an option. Bring sketches or photos of your proposed cake design to your florist before your big day to see if they’re willing to craft some pieces for it. You could go with something a simple as a single flower or as elaborate as an arrangement that cascades down the side of your showstopping confection. Remember, the flowers that go on your cake should match the overall colour scheme of your wedding (you don’t want them to clash!). If you have a designated dessert table you may want to add an arrangement or two to that, as well. In this case we’d recommend going with something similar to your centerpieces. 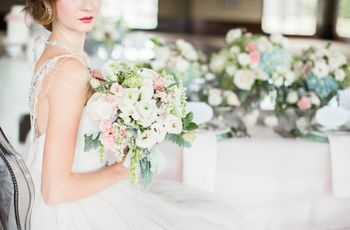 Did you spend hours labouring over your wedding bouquet? Well then, it may be a little difficult to throw away. 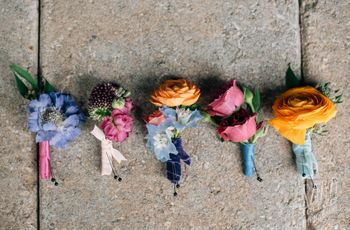 If you want to hold onto your personal floral masterpiece a little bit longer, ask your florist to create a second smaller bouquet for the toss. It’ll give you a little longer to admire your work while allowing you to take part in the time-honoured tradition.